Scientific Advisor Wesley Schultz, PhD and President Jennifer Tabanico were invited to speak at a symposium hosted jointly by the American Academy of Arts & Sciences (AAAS) and the New York State Energy Research and Development Authority (NYSERDA). On June 16, 2014, Wes and Jennifer gave a joint presentation on the topic “How to use Community-Based Social Marketing to Foster Behaviors Central to a Sustainable, Healthy Environment.” The Academy is the nation’s oldest learned society and independent, non-partisan research center, so Action Research was thrilled to bring our expertise to the “Designing and Evaluating Behavioral Projects” panel. Wes and Jennifer’s take-away message was that no “one-size-fits-all” CBSM blueprint exists that can be deployed to achieve every kind of desired behavior change. Different target audiences and behavior types, settings and frequencies require different approaches. They emphasized that the key to any successful behavior change program is to first gather information from the target audience to determine their barriers to engaging in the desired behavior, then deploy tailored structural, policy, technological, or motivational interventions to eliminate the identified barriers. One CBSM pilot Action Research implemented for the City of Oceanside exemplifies this tailored approach. The City’s goal was to decrease the amount of pet waste left along the San Luis Rey River bike path by dog walkers. Action Research staff surveyed residents who walk their dogs along the bike path to determine their barriers to picking up pet waste. Primary barriers were forgetting to bring a baggie for pet waste collection and lack of awareness that pet waste along the river contributes to pollution. Primary benefits were a strong belief in social responsibility and concern for local waterways.To remove these barriers, Action Research designed both structural and motivational behavior change interventions. 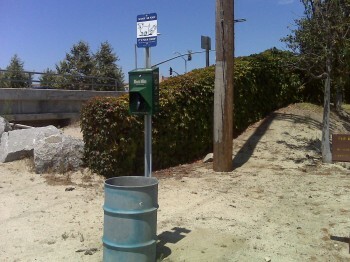 Multiple dispensers of pet waste collection bags were installed near trash bins along the bike path. Highly visible sign “prompts” on the dispensers displayed images of responsible pet waste collection and the message “Scoop the Poop/It’s Your Doody/ Do your part to prevent water pollution”. These interventions resulted in a 23% decrease in pet waste along the San Luis Rey River bike path.